An international committee of experts from the American Diabetes Association, the European Association for the Study of Diabetes and the International Diabetes Federation recommends that the A1C test be the primary test used to diagnose pre-diabetes, type 1 diabetes and type 2 diabetes. When the A1C test is used to diagnose diabetes, an A1C level of 6.5 percent or higher on two separate tests indicates you have diabetes. 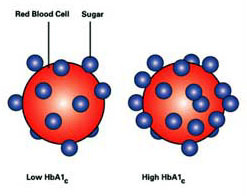 A result between 5.7 and 6.4 percent is considered pre-diabetes, which indicates a high risk of developing diabetes. As you may remember, I had gestational diabetes with both my pregnancies which is a risk factor in developing diabetes. The last two A1C tests that I had were 6.4 and 6.8. These were done in late 2010. For this reason, along with all the other A1C tests I have had done since giving birth to Neviyah is the reason I was diagnosed as having pre-diabetes. Often times, my A1C levels were well into the diabetes levels, but never two times in a row. I have always fluctuated between pre-diabetic and diabetic in my levels. In 2011, I stayed away from the test. I knew my sugars were out of control, and I was experiencing rapid drops in my levels that led to things like dizziness, irritability, and headaches. Oh, and fatigue. Big time fatigue. I followed the diabetes diet pretty well, depriving myself of carbs, balancing carbs and proteins, and nothing seemed to work. You may remember my attempts to workout that resulted in hours of low blood sugar teeter-tottering, dizziness, and generally feeling like crap or having to stop. Then I found the book Reversing Diabetes. I first heard of it through some random woman at shul while we waited for religious school to get out. Thank you, whomever you were! Then again, after I saw a documentary, I went to its website and saw this book. I immediate bought and read it, and began my plant strong, vegan diet. Yesterday, I took the test. Today I got the results. I have NEVER had a reading under 6.4. EVER. I am ecstatic! I feel incredibly happy, like a weight has been lifted! For years I have worried about this. Not only does it run in my family, but I am one of those people who, even when sticking 100% to the diabetes diet recommended and for which I have nutrition counseled for, still had no stability in my blood sugar readings. Since I have implemented this plant strong diet, I can feel the changes and see the changes...and now have one more piece of evidence to give me piece of mind! Wooooooooooooooooo hooooooooooooooooo! way to go and congrats k! that's really awesome AND inspiring!